MÜNSTER -Das Heilig Judisch Land mit Ausztheilung der Zwolff Geschlechter. MÜNSTER,S. - Das Heilig Judisch Land mit Ausztheilung der Zwolff Geschlechter. Das Heilig Judisch Land mit Ausztheilung der Zwolff Geschlechter. - MÜNSTER,S. Title : Das Heilig Judisch Land mit Ausztheilung der Zwolff Geschlechter.. Size : 10.6 x 13.4 inches. / 27.0 x 34.0 cm. 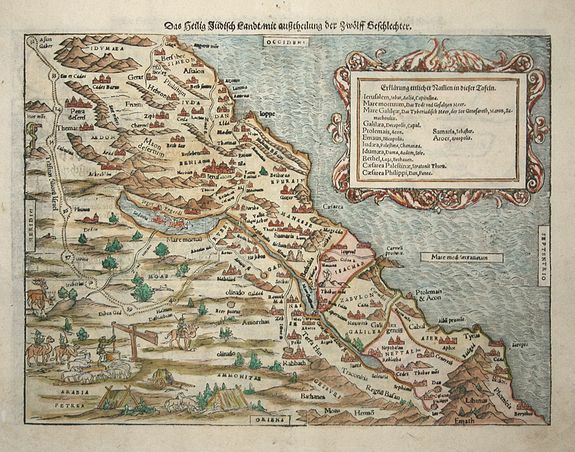 Description :Munster based this map of the Holy Land on maps by Mercator and Ziegler and filled it with numerous woodcut vignettes. The unusual orientation of the map places west at the top with the coastline running southwest to northeast. The shoreline is remarkably accurate for the period, covering from Sidon and the land of the Phoenicians in the north, to Gaza in the south. The last nine encampments of the wandering Israelites during the Exodus are shown along with the tribal divisions. The cartouche contains an index of place names that appear on the map with each boldfaced entry followed in italics by the alternative names by which the site was known.